An early morning walk to the Byron Bay lighthouse is a great way to start the day. The sunrises are spectacular and you can often see sharks, sea turtles, whales, dolphins and stingrays in the water. Sea eagles and ospreys are just two of the bird species that can be seen on your walk plus if you are very quiet, you will probably see a wallaby or two nibbling grass beside the track. 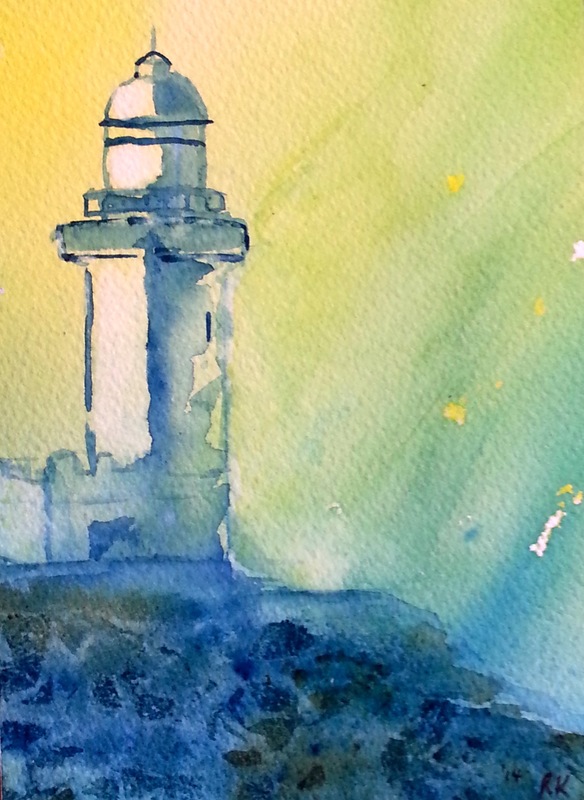 Here is my watercolour painting of Byron Bay lighthouse – purchased by a honeymooning English couple who were married in a lighthouse and who collect pictures of lighthouses. I found your blog by accident on reader. Lovely watercolours. And I so envy you your walk. Thanks. It’s a great way to start the day. I like how the area below the lighthouse is open to interpretation: it could be water or a rugged shore.